This is a familiar story to us – and when we open scripture to a comfortable place, we might look more closely, more intensely, to see if we are perhaps missing something because of the familiarity. Samson enters into a cycle familiar to all of us. He succumbs to Delilah and to the plot surrounding him. He is human. He fails. He suffers. He has hope. He repents. He makes reparation for his former action. He is honored. He brings the light of truth into the darkness of greed and corruption. After closer reading, we see the cycle so familiar in our own lives. After closer reading, we do not understand the mystery of what happened more, but what we do understand is that no destruction or death can overcome the bright light of God’s goodness and mercy, and we are – we hope – a little more willing to see God’s goodness in our own lives..
From MAGNIFICAT today: The light shines in the darkness, and the darkness has not overcome it. (John 1:5) God is mystery. The maker of the universe dwells in light inaccessible, so bright that it blinds the probing eye, the questioning mind. For those who are powerless, that they may experience your power employed on their behalf. For those who have abandoned hope, that they may know your mercy. For those who fail to see you in mystery, that they may come to feel your gentle love. Cameron, Peter John. “Prayer for the Morning.” MAGNIFICAT. 9.4 (2008). Print. Adapted from a Favorite written on April 9, 2008. This is what we humans try to avoid at all cost – suffering without end – and yet this is impossible for us. We will only experience true joy that lasts when we learn to allow suffering to transform us – and this is what I was thinking as I drove through Long Green Valley this morning on my way to work. The heavy mist curled through the vineyards at our local winery, nourishing the grapes which are promised for the fall. The vines are well tended, all reaching out to support one another – having been pruned back to little more than stumps last winter. Interlocked, these branches reinforce one another, anticipating the heavy crop to come. The workers go through their strict cycle of pruning and flourishing; the plants burgeon, wither and burgeon again, answering their maker’s call to yield fruit that will sustain. I was imagining myself as a branch of God’s vines just as Christ tells us in John 15: I am the true vine, and my Father is the true grower. He takes away every branch in me that does not bear fruit, and everyone that does he prunes so that it bears more fruit. You are already pruned because of the word that I spoke to you. Remain in me as I remain in you. Just as a branch cannot bear fruit on its own unless it remains on the vine, so neither can you unless you remain in me. I am the vine, you are the branches. Whosoever remains in me and I in him will bear much fruit, because without me you can do nothing. This chapter in Job is followed by ones in which people who call themselves his friends urge him to confess his sins so that he might enjoy God’s grace once again. Job will repeat often in this story that he is innocent – and he is. His acquaintances will continue to berate him. He will continue to trust in God. And in the end . . . he will be restored. We often feel as though we are suffering without end . . . and we are. Yet, this suffering brings about abundant fruit which we will not have to struggle to produce. This suffering carries within itself the seeds of restoration. This suffering is not to be avoided for when it is, we avoid the opportunity to be touched, and held and cured by the master grower’s hands. And this is something we do not want to miss. This is a familiar story to us – and when we open scripture to a comfortable place, we look more closely, more intensely, to see if we have perhaps missing something because of the familiarity. 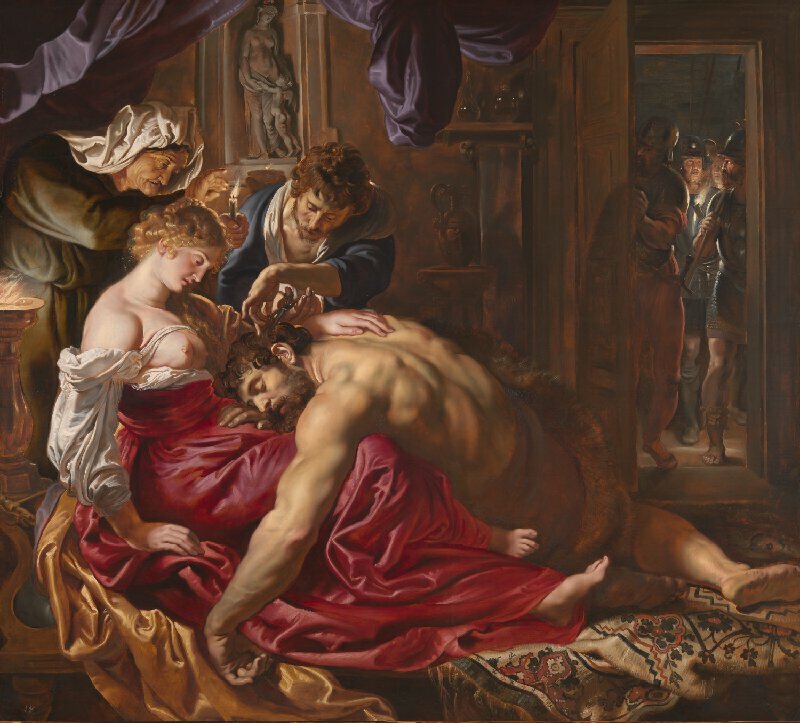 Samson succumbs to Delilah and to the plot surrounding him. He is human. He fails. He suffers. He has hope. He repents. He makes reparation for his former action. He is honored. He brings the light of truth into the darkness of greed and corruption. We do not understand the mystery of what happened more, but what we do understand is that nothing ultimately wins over destruction and death. Written on April 9, 2008 and posted today as a Favorite. Cameron, Peter John. “Prayer for the Morning.” MAGNIFICAT. 4.9 (2008). Print.